-- South Dakota’s own Sioux Horse Effigy, an artifact from the collection of the Museum of the South Dakota State Historical Society at the Cultural Heritage Center in Pierre, will be on display March 9-May 10 at the Metropolitan Museum of Art in New York City. “The Plains Indians: Artists of Earth and Sky,” an exhibition of Plains Indian masterworks, has already been displayed in Paris at musée du quai Branly and at the Nelson-Atkins Museum of Art in Kansas City, Mo. More than 600 guests were at a private opening for the exhibition March 2 in New York, with representatives from the South Dakota State Historical Society in attendance. The exhibit is notable for its more than 130 works of art from 57 European, Canadian and American institutions, and private collections will be displayed in an unprecedented continuum from pre-contact to the present-day. Featured works include numbers of the great early Plains Indian robes, and other masterworks collected in the 18th century by European explorers and taken back to the continent never to return to America until now. 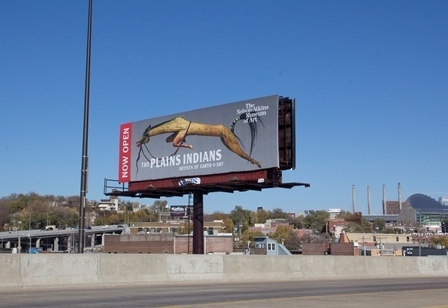 The popularity of the effigy, and its importance to Native American history and art, is reflected in the ways its image has been used to market the exhibition. The travels of the Sioux Horse Effigy, as well as photos and information about the exhibit locations, are on display in a small exhibit about the effigy at the Cultural Heritage Center in Pierre.